When one conscious person does just one significant action, the world changes. So let's ALL do one significant thing on Thursday 2nd October to support a non-violent world. This month's tip is also here on video. Please share it with as many people as possible to promote International Non-Violence Day. 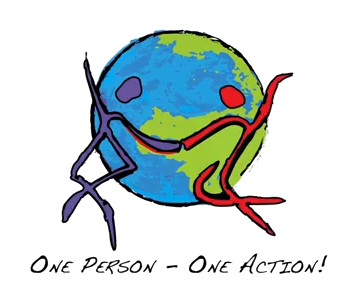 One Person - One Action! Thursday 2nd October (Mahatma Gandhi's birthday) has been dedicated by the UN to NON-violence. It's a day to say, 'NO!' - NO to fear and pain; NO to hatred and anger. But by itself, 'NO' is not enough. NO has a positive influence in the world only when it is transformed into 'YES'. 'NO' holds huge reservoirs of energy. It works by pushing away what you don't want. Take a long look next time you're feeling at all bad - whether angry, frustrated, frightened, depressed or just mildly miffed. Deep inside those feelings, there's a totally natural, totally understandable response to anything that bothers you. At this instinctive, non-verbal level you find a more-or-less-powerful UGH! or OUCH! Sadly, when you translate 'Ugh!' or 'Ouch!' into words and actions, it easily comes across as aggression (or as 'passive-aggression', if you bottle it up). Even a small irritable 'No!' works in the same basic way as a huge explosive 'NO!' which, at its most extreme, morphs into violence. To change the world, we need to transform all that NO-energy into YES-energy. When you are fired up with all the passion and purpose of a deep YES! your words and actions affirm other people, they affirm life. This is the opposite of aggression. It never translates into violence. On this International Day of Non-Violence I propose we do something to transform NO into YES. If it goes missing in you, it goes missing in the world (because you are part of the world). Nominate someone to do the same! If you wish, share what you did HERE. The more of us who do this, the more the world will change. We say, to shine one corner of the world - that is enough. Not the whole world - just make it clear where you are. A friend has criticised you unfairly. You feel a lack of ... (say) fairness. WHAT can you do to bring it back? Fairness - Do something, say something, think something - ANYTHING - so long as it brings more fairness into the world. As you tune into fairness in this way, the human quality of fairness grows again in you too. You might help somebody less lucky than you, speak up for somebody struggling to find their voice, give away your spare socks to people who don't have socks ... or if you habitually ignore yourself in favour of others, try giving yourself a treat instead! You hear about dreadful decapitations on the internet. You feel a lack of kindness or wisdom (or some other quality you value). Kindness or Wisdom: Do or say ANYTHING that brings these qualities to life in the world. You might empathise with an 'irritating colleague' by considering their deeper needs, tell your mum you love her, do something which nourishes you, plan your day so you live it calmly and happily ... YOU decide! Then, in true ice-bucket style, nominate a friend or colleague to do the same. The Mindful Ice Bucket Challenge! Like many people, I'm sensitive to criticism - especially if it seems unfair; and even more if it's delivered in a self-righteous, judgemental way which tells me I'm at fault. 'You haven't just DONE something wrong!' my friend implies, 'You actually ARE wrong! Immediately, I want to get rid of this feeling of wrongness. I want to push it away. If I speak directly from my sense of 'NO!' or 'OUCH!' what will I say or do? ... Leap to my own defence! But then, however nicely I try to say it, my friend will feel attacked too. Yet if I can find my inner YES, my angry energy changes. It transforms into a strong, calm determination, into courage. So I take time with my feelings; and here I discover that my feelings are telling me how much I want to be seen and heard for who I am - with fairness. Now, I have found the missing quality. Now, even if I cannot resolve things straightaway with my friend, I can still increase my own inner reserves of fairness. And as I feel that quality more, I'm less likely to be knocked; more likely to find a peaceful outcome. As fairness grows in me, it grows in the world. So what will I do on the International Day of Non-Violence? Perhaps I'll ask a different friend to give me the delicious gift of seeing me fairly. Perhaps I will give that gift to somebody else. Perhaps I will be politically active, and search the web for ways to give disadvantaged people a voice, or I will speak up for fellow planet-dwellers who do not use words, the animals or trees .... The choices are endlessly creative. Acting on one of them, I will bring the qualities I lack back into the world, because I bring them back in me.